Although Sonbert lived in San Francisco since the early 1970s, he spent much time in New York, and traveled frequently, making personal appearances at showings of his works at film festivals, museums, cinematheques, and other leading cultural institutions worldwide. Sonbert taught filmmaking at the San Francisco Art Institute, the School of the Art Institute of Chicago, and Bard College. He also wrote opera and film reviews for weekly publications in San Francisco. Throughout his life, Sonbert was honored by career retrospectives in Austria, France, Germany, Norway, and the United States, and individual films are represented in numerous institutional collections in the United States, Europe, and Asia. Sonbert’s passionate interest in film, classical music, experimental poetry, and travel is reflected in his films. Warren Sonbert lived a completely engaged life, and the images culled from that life formed the raw material of his artistic expression. Sonbert’s earliest films, in which he captured the spirit of his generation, were inspired first by the university milieu and then by the denizens of the Warhol art scene, including superstars René Ricard and Gerard Malanga. In these loosely structured narratives, Sonbert boldly experimented with the relationship between filmmaker and protagonists through extensively choreographed hand-held camera movements within each shot. The mood of these films was further modulated by chiaroscuro effects, achieved primarily through natural lighting (in both indoor and outdoor shots), combined with variations in the raw film stock and the exposure and the use of rock-and-roll music on the soundtrack. 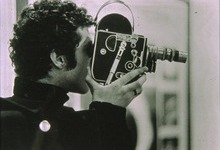 In the late 1960s, as Sonbert began to carry his Bolex camera on international trips, his cinematic strategy shifted to incorporate footage from these travels together with sections from his earlier films. Sonbert’s works from this period show him perfecting his ability to transform his early experiments into the more accomplished works of a mature artist by using his own distinct brand of “polyvalent montage”,” a technique in which each shot “can be combined with surrounding shots along potentially many dimensions”. Sonbert built upon his early experiments in camera movement, lighting, and framing to create brilliantly edited masterworks that encompass not only his New York milieu, but also the larger sphere of human activity. In these films he commented upon such contemporary issues as art and industry, news reportage and its effect on our lives, and the interrelationship between the creative arts. His late works culminated in symphonic montages (both silent and sound) that unite universal human gestures into singular works of moving image artistry. During his career, Sonbert made 18 films. Before he died in 1995, Sonbert was working on WHIPLASH. The postproduction on Sonbert’s final film was completed according to Sonbert’s specific instructions by filmmaker Jeff Scher. WHIPLASH had its world premiere at The New York Film Festival in 1997. Following Warren’s untimely death in 1995, a project was undertaken under the auspices of the Estate Project for Artists with AIDS in conjunction with curator Jon Gartenberg to restore WHIPLASH to public view as well as to preserve this filmmaker’s entire body of extant work.. A complete set of preservation negatives of Sonbert’s films are now housed at the Academy Film Archives in Los Angeles. Sonbert retrospectives have subsequently taken place at the Guggenheim Museum (1999), the San Francisco Museum of Modern Art (2000), the Centre Pompidou (2002), the Austrian Filmmuseum (2005), Anthology Film Archives (2006), and the Harvard Film Archive (2008). Prints of Sonbert’s films are now available for European distribution exclusively from Light Cone, the organization that is planning a new tour of the Sonbert films throughout European cinematheques, festivals, and other cultural institutions beginning in the fall of 2012. Click here for the Warren Sonbert Retrospective Touring Programs brochure.